Volunteer Dave R. first met Todd on the tennis court when he joined a match as a doubles partner of a mutual friend. "Heck of a good tennis player," marveled Dave of Todd. Over the course of several matches, Dave discovered that Todd was the CEO of Extreme Pizza. "What do you do with your leftovers," the ever intrepid Food Runner Dave asked. Before Todd even answered, Dave threw in that Amici's East Coast Pizzeria, where he'd filled in on a food run a few times, was donating ten pizzas per week as a participant in Food Runners planned overage program. That got Todd to thinking. It was just before the holidays and Todd had been working with ReachLocal on some online holiday marketing strategies for Extreme Pizza. The final plan was simple. It involved a gift card distributed to businesses and friends selected by Extreme Pizza that, when used, guaranteed that Extreme Pizza would donate to charity, pizza equal in amount to the amount purchased with the gift card. Extreme Pizza's charity of choice was Food Runners. The cards got swiped. The holiday pizza parties raged. The totals were calculated. Starting this week, Extreme Pizza is donating ten pizzas per week to Food Runners until the end of July. And, who doesn't love pizza?.... The tenants at Veteran's Commons, a brand new supportive housing building for homeless and disabled vets (enjoying their grand opening ceremonies on the very day of this writing), were thrilled when Cina, a Food Runners volunteer on her very first food run, arrived with the first Extreme Pizza delivery Monday afternoon. "Really? This is for us?" a staff member at Veteran's Commons reported a surprised client saying. "The tenants were thrilled," the staff member continued. "A roof over their heads and food too! Thank you from all of us. This is wonderful. I can't tell you how much this helps, not only for the obvious reason of getting enough to eat, but for reasons of spirit as well." It's 3:30PM on a Tuesday at Booker T. Washington Community Service Center. The kids shuffle in after a long day at school: kindergartners to high schoolers, about 50 in total. The majority in the program are from low-income families. They all have homework. All of them are hungry. 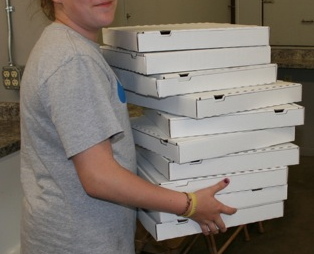 The front door opens and in walks a Food Runners volunteer with ten, stacked-high boxes of freshly made pizza from Amici's East Coast Pizzeria. "Tuesday is everyone's favorite day at Booker T.," smiles staff member Irene. "From the kids to their parents. The kids get food they need and because of the food, they concentrate better on their homework. The parents love that. And they love that they get to save a little money on food too. Booker T. loves Food Runners!" The request for Food Runners pick ups at Escape from New York Pizza in the Mission comes in on random days, twice a week on average. Sometimes more. The donation usually consists of 3-4 boxes filled with slices of many varieties. 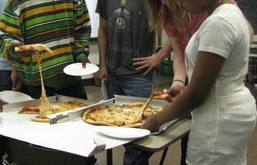 "We never know when the pizza will be coming, but it's always welcome," states Patricia B., program coordinator for the after school program at nearby John O'Connell High School. "Have you ever seen the program provided 'snack?' It's not enough to feed a mouse let alone a teenager. Lots of my kids don't get enough to eat on a regular basis, so this pizza makes a big difference. Helps with homework focus too. Thank you Food Runners. You are contributing to higher education through satisfied bellies!" 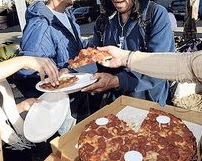 "The pizzas, when they come, are the best part of the deliveries," notes Talkline Family Support Center of the pies that often come in the Thursday morning donations from Arizmendi Bakery, picked up and delivered by rotating Food Runners volunteers. "The pizzas are great for the stressed out, low-income and no-income parents we work with. Rib-stickin' and tension relievin'. Parents who've had enough to eat are better equipped to handle their kids without lashing out. 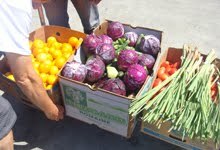 It's Food Runners to the rescue on Thursdays!" What's your local pizza joint doing with the unsold slices at the end of the night? Could they package them up for Food Runners like Escape from New York does? Next time you're out enjoying a wedge of cheesy goodness, ask. 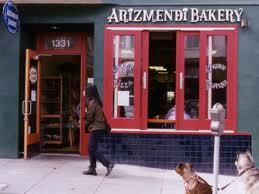 Tell them to call Food Runners at 415-929-1866. A little pizza can go a long way for someone who doesn't get enough to eat.